(P1) Only on certain competitive international routes anyway. 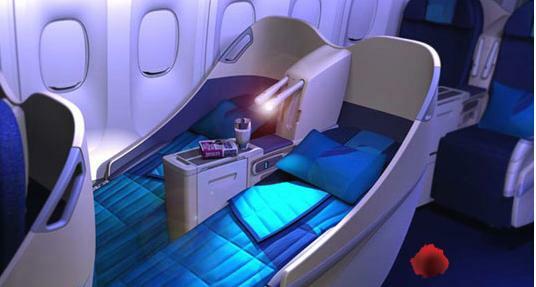 (P2) Your dreams of sitting smugly and glamorously up at the front of the plane may finally be within reach. Flight prices for plush, business-class seats have been much cheaper this year on several popular international routes. (P3) Using data from the travel search site Kayak.com, Quartz pointed out that the median airfare for a business-class ticket between New York City and London was $2,006 during the first six months of 2016. That’s 37% less than the median fare for the same route during the same period in 2015 ($3,160). (P4) Business-class ticket prices on routes such as Chicago-Bangkok, Denver-Paris, and Miami-Tokyo have also dipped significantly. For Chicago-Bangkok, the median one-way fare was over $5,000 in the first half of 2015. A year later, it was $3,750. That’s still not remotely cheap ($7,500 round trip), but passengers would be paying roughly $2,500 less for the same flight and the same luxurious in-flight experience in 2016. (P5) What’s caused the price drop? For the most part, the answer is cheaper fuel, combined with more competition. As gas and jet fuel prices have dropped, the airlines have been enjoying record profits. This has allowed them to charge less for flights and boost business while still yielding outstanding profits. (P6) When one airline offers cheaper promotional prices to fill its planes, especially in the all-important, highly profitable upper-class sections up front, the competition tends to follow suit. (P7) As a result, airline passengers are the beneficiaries of somewhat more affordable airfare, and maybe even the opportunity to see how good life really is when you’re not stuck in a cramped coach-class seat. Have you ever flown in business class? If yes, describe it? If no, would you like to? Do you think airlines should lower the price of business class even more? Why or why not? What airline is your favorite? Why? How can airlines improve coach class seats? Which resource did Quartz get their information from? How much was a round trip ticket from Chicago to Bangkok in 2016? What 2 reasons are given for the drop in business class airfare? Who benefits from competition among the airlines?